Since I'm the first one to post in 2011 - Happy New Year to all! I've been working on the Rainbow Scrap Challenge over at So Scrappy blog. 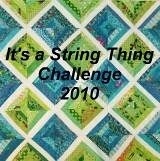 Angela designates a color or theme every month and has challenged us to make something whether it be a small project, a large one, or to create individual blocks to make a single quilt at the end of the year. This month's color is blue. I decided to use some of my strips and make a string quilt. I also did the Bonnie Hunter Roll Roll Cotton Boll mystery, and after I'd sewn all of those string blocks for the quilt, I kind of missed them so this is what I've been working on. Usually I make my string blocks like the one on the left below. I use either phone book pages or a scribble pad from the dollar store and cut foundations. This isn't necessary to make a string block, but if I'm watching TV or a movie while sewing, I can soon lose track of how long my strips should be for a block. Then I draw a line on the diagonal so I can get that black strip centered to create a secondary design. To make the chevron blocks as shown above, I sew the strips straight up and down. Beginning of quilt with strips sewn on the diagonal. To make the blocks that chevron, you layer two blocks right sides together with the strips running the same direction. Draw a line diagonally on the foundation paper. Sew 1/4" on both sides of the drawn line. Cut on the solid drawn line. You will end up with two blocks that look something like this. You can also turn every other row of these blocks upside down to create a different look. I hope all of you out there are sewing some string blocks, too! Thanks for posting how you make your chevron strings. Your blue strings are awesome! Strings are so addictive! How beautiful. I am still trying to wrap my mind around the fact that I can us diametrically opposed fabrics in the same quilt and it WILL look wonderful! glen: I am growing, slowly but surely! Chevron strings. Who would'a thunk how easy they are. Thanks for sharing!